Manchester United Views: Rooney Spares United's Blushes. Here are my own thoughts on everything concerning Manchester United the biggest supported team on the planet. Wayne Rooney's 93rd minute spot kick sent Manchester United into the draw for the FA Cup 4th round after another dismal display that had the fans voicing their dismay at the final whistle. With Young in the 'red zone', there was another chance for youngster Borthwick-Jackson to join a recalled Darmian in the back four and Fellaini received the nod in midfield with the duo of Carrick and Schneiderlin being given a rest. Recalled loanee Will 'Mike' Keane joined the squad on the bench with other youngsters Lingard and Pereira. Memphis was once again made to bide his time as he was named as a substitute. After a quarter of an hour, it seemed that United's tactics were to bore the opposition to death, maybe the weather dampened the proceedings but even so this was awful from the home side. The visitors came to life with a great move that ended with a delightful ball played across De Gea's area that had to be headed behind for a corner by Darmian. Fellaini really looked to lack any purpose in his play as he gave a simple ball away in the middle of the park which provided Sheffield Utd with an opportunity to attack. Terrible and lazy play by the Belgian which cannot be accepted. Darmian was trying his best to deliver the goods from the right wing, but the visitors were well organised at the back and dealt with everything United threw at them, which wasn't a lot to be honest. Ten minutes before half-time Rooney was almost in on goal after a threaded ball from Herrera, but keeper Long reacted quickly by racing off his line to collect the ball at the captain's feet. There was a shout for a penalty as Schweinsteiger seemed to be pulled back as he ran into the box chasing a through ball by Blind. It was all in vain as the referee waved play on. 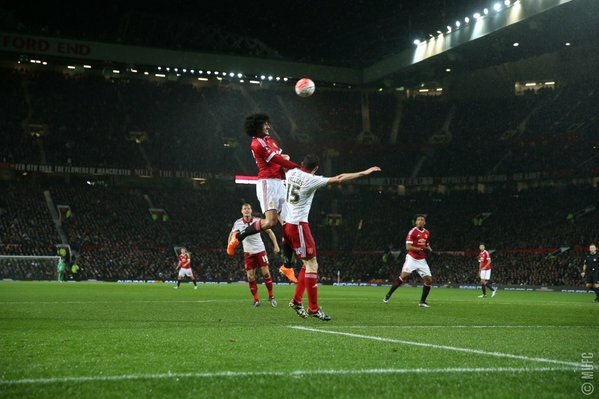 The lack of ideas shown by United was evident when they won a couple of free-kicks. One was wasted by a short pass, when the area was packed. The other was hit straight against the defensive wall by Rooney. Blind blasted over from the edge of the area with literally the last kick of the half and in that poor effort summed up the bad day United were having. Half-time and those who had braved the rain witnessed a damp squid of a half in which United hadn't managed one effort on goal. Their play had reverted back to the desperate December displays and all this against a side from League One. 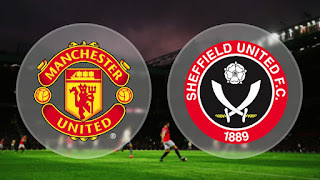 The visitors had come with a game plan to defend against United which had worked to frustrate the home team and the home fans who voiced their displeasure with boos once again ringing in the player's ears as they made their way down the tunnel. Man United kicked off the second-half attacking the Stretford End with the hope of putting the dire first 45 minutes behind them with no changes made by van Gaal. However, it was the same old story with misplaced passes together with a lack of conviction in their play that made for a very sorry sight indeed. In fact, it has to be said this was shaping up to be one of the worst United team displays ever seen on the famous Old Trafford pitch. Hoofing the ball into the area aiming for the head of Fellaini, who made no serious effort to win the ball, was the best United had to offer. The visitors began to sense the uncertainty in the home side and started to play some decent football without putting any serious pressure on De Gea's goal. 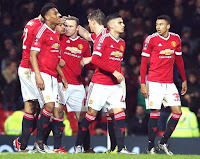 Van Gaal made a double change on the hour mark when he took off Herrera and Mata and introduced Lingard and Memphis, which didn't please the home faithful at all as they chanted Herrera's name to show the manager their displeasure at the change when it should have been Fellaini who had made way. 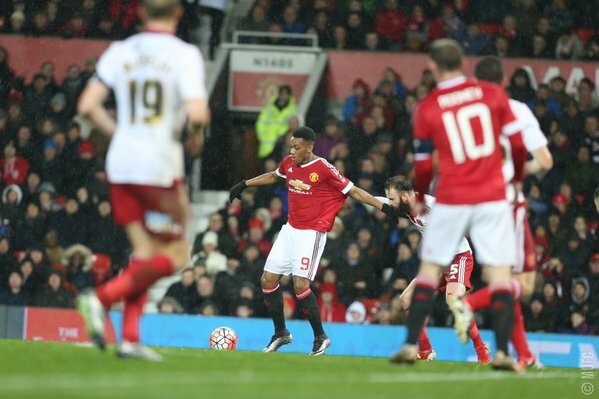 His changes had no immediate effect on the Red Devils' performance until Memphis tried his luck from distance. After his shot whistled wide it was met by a sarcastic round of applause by the crowd as it was by far the closest they had come. 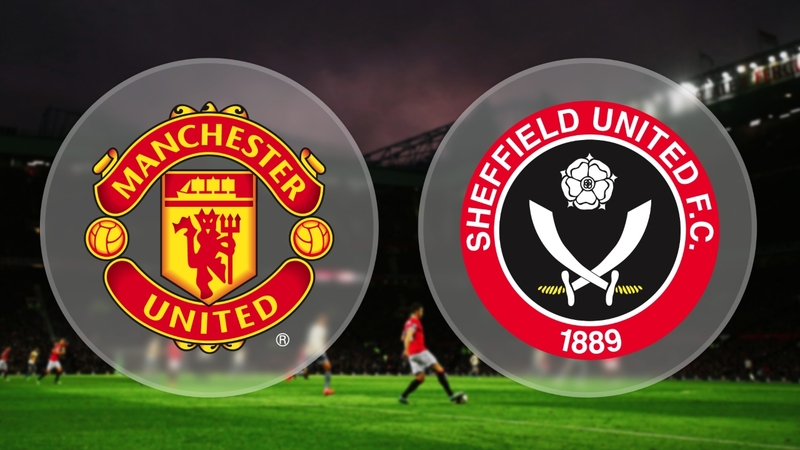 Sheffield United managed to do what United couldn't after 70 minutes and had a shot on target from Basham which De Gea collected easily. 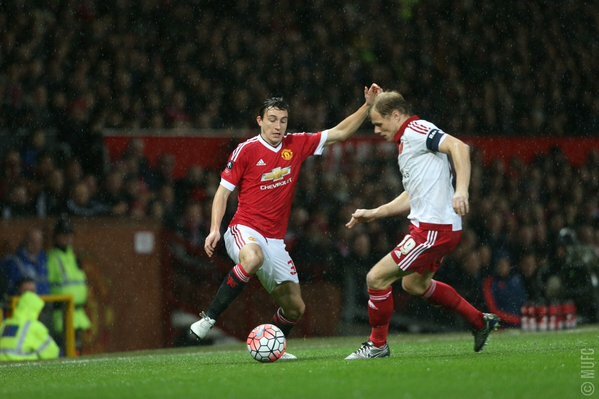 At the other end Darmian did dig a shot out from close range but he was tumbling as he did and the chance was gone. Even the experienced international Schweinsteiger couldn't direct his shot on target as he received the ball unmarked on the edge of the area. As the match entered the last ten minutes van Gaal made his last throw of the dice as he, at last, took off Fellaini and gave Pereira a chance to become the hero. United did create a chance when Lingard placed a great ball in the area for Martial who was immediately closed down by the defence and as the ball was cleared Schweinsteiger was involved in a 50-50 collision and caught his knee, which at first looked likely to require the stretcher, but true to form he got up and ran it off so United wouldn't be reduced to ten men for the last five minutes. Things went from bad to worse as a free kick was played into the danger area and was met by Martial, whose snap shot was saved but the loose rebound was not mopped up at the far post by Smalling. There were six minutes of added time to give United the chance they needed to score and it worked as Memphis won a dubious penalty as he ran into the opposition's area to give Rooney the chance from the spot which he took with aplomb to guarantee a 4th round tie. On closer inspection, it was a close call for the penalty, but even though Memphis went to ground with more theatrics than a Shakespearean play he was definitely caught by the defenders studs. At the moment, United will accept anything they are given. Full-time and thanks to Rooney's 93rd-minute penalty United will go into the bag for the 4th round draw and his spot kick certainly saved the home side's blushes, however, it will not detract from the fact that they were just plain awful. Credit has to be paid to the visitors who came so close to forcing a replay and, therefore, applying more pressure on van Gaal. The longer van Gaal sticks to his methods the quicker he will be on his way as it is clearly not working and the fact that his team can't overcome a League One side until added time doesn't exactly fill anybody with confidence for the challenges ahead. Here was a chance for the Man United players to show they had turned the corner and put on a display of attacking football, but all they managed to do was to prove that even though they won they are not 'United' in any way, shape or form. United Up For The Cup. Derby County v Man United: FA Cup Preview. United Is Safe In De Gea's Hands. Man United vs Liverpool Rivalry Part 2.